← Pokemon X Samurai Warriors = What The!? “Sakura” (cherry blossom) is a word many people know well. Sakura viewing is “hanami” (花見、はなみ), or lit. flower viewing. Outside of a weather context, “zensen” (前線、ぜんせん) would mean “front” in the sense of WWII’s Eastern Front or Western Front in Europe, but here it means weather front. 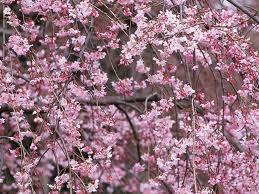 The reason for using “zensen” here is because cherry blossoms do not bloom across the entire country at the same time. The “cherry blossom front” moves northward over time as warmer weather hits different parts of Japan. That’s why the information follows normal weather reports during early spring. This entry was posted in Culture, Japan, Japanese, Languages and tagged cherry, front, Japan, Japanese, language, learn, lines, nihongo, sakura, zensen. Bookmark the permalink.